We can now arrange one to one tuition over Skype between you and one of our worldwide contacts. 1. Email us at contact@arabicpod.net and let us know you’re interested. Basically, by going through us you will be covered, as in your funds will remain with us until you have had the lessons and we can refund you on unclaimed lessons if you were not happy for whatever reason. Contact us for further information. Due to popular demand we have introduced new “private” feeds that you can use in various applications, such as iTunes, to download not just beginner, but all podcasts apart from advanced. You can also choose the feed that will additionally download the associated PLC, Transcript, Audio Transcript and any additional audio or video content supplied with the lesson. You must be a paying member (Basic or Premium) to view all the podcasts on this feed, otherwise it will only display beginner ones. Below are illustrated steps to help you subscribe to one of these feeds on iTunes. 5. You can now download all the podcasts via iTunes at your convenience! Mohamed has asked me to contribute to the ﻤﺪﻮﻨﺔ. He has suggested that I should say something about learning Arabic. My interest in Arabic is primarily aesthetic. Even as a small child I loved Arabic music, and I was impressed by the beauty of the Arabic language. The music and the language have a magical quality which sends a tingle down my spine. I would have liked to learn a foreign language at primary school, but English, alas, was the only language on the curriculum although all the teachers knew Latin or Greek. When I was sent to grammar school at the age of eleven I immediately began to learn French and Latin. By the age of twelve I had attained such a level of proficiency in both languages that the headmaster described me as “a promising pupil”. My uncle, who was the senior history master at the same school, told me this was high praise, for the headmaster was hard to please and rarely praised anyone except Homer, Vergil, Dante or Racine. He was a brilliant orator and a scholar of no mean attainments. He spoke twelve languages (including Chinese, Japanese and Russian), but he was a ruthless despot who ruled with an iron fist, and he was feared by staff and pupils alike on account of his terrifying outbursts of rage which left everyone speechless with shock and horror. At the age of fifteen I began to learn German, and when I left school three years later I had attained a level of proficiency which even the headmaster found impressive. The French consulate and the German embassy in London sent me book prizes, and the headmaster suggested I might enter the diplomatic service. I decided to specialise in modern languages and got on very well with the senior lecturer in the French department, an extraordinarily charming and gifted Frenchman who impressed everyone by his eloquence and erudition. His English was as good as his French, and he was envied by all his colleagues. My relations with the German lecturers were somewhat less cordial, but they were, on the whole, quite good. The head of the German department, a very clever, witty and eloquent gentleman from Hamburg, told me I knew too much. Another lecturer, a talented and ambitious Viennese lady who is now world-famous, once summoned me to her office for a private interview. She never praised anyone, and she exuded a kind of chill which made her unapproachable. Peering pensively at me through her rimless spectacles, and speaking in a precise, metallic voice which made her sound rather like a robot, she said my German was “almost too perfect”. She accused me of parodying Hermann August Korff and Thomas Mann and added that she found me positively “intimidating”. I suppose that was a kind of reluctant praise, for it was hard to imagine anyone intimidating such an intelligent, self-possessed and formidably dynamic lady. Many years later, when I had settled definitively in Germany, I acquired an Arabic grammar written by a very competent Austrian scholar (Ambros, Einführung in die moderne arabische Schriftsprache). A bookseller offered me the volume for next to nothing because none of his other customers were willing to purchase it. I perused several chapters of the book and found it extremely interesting, but I had no idea how the Arabic words in the book were pronounced, and I found the bizarre and complex transliteration system very off-putting. Having reached the conclusion that Arabic was unlearnable, I consigned the book to one of the darkest and least accessible corners of my library and forgot about it. Towards the end of November 2009, I listened to some interesting BBC reports about the situation in the Middle East. I happened to click on a link which led me to the BBC’s Arabic website. Unable to master my curiosity, I clicked on a button and listened attentively. I could only understand a few words, but I was immediately captivated by the magical cadences of the Arabic language and decided that I ought to take the plunge. The next day I started to look for Arabic videos on YouTube and discovered the fifty-fifth sura. I clicked on the video and listened. I was deeply impressed by the musical qualities of the recitation and by the dream-like beauty of the refrain which means “Then which of the favours of your Lord will you deny?” The back door was open, and two cats who had been wandering around in the garden came slinking in. They sat down in front of the table where I had placed my computer, and I had the impression that they enjoyed the recitation as much as I did. They never moved until the recitation ended. Shortly afterwards, my peregrinations through the labyrinthine ramifications of the Internet led me to an Arabicpod video (“Down the beach”). Ehab and Mohamed looked very friendly and likeable, and the dialogue presented in the video seemed more accessible than Ambros’ somewhat arid explanations. I decided to visit the Arabicpod.net website, and I was not disappointed. Ehab and Mohamed have succeeded in bringing Arabic to life. They present the language in such a way that it seems more accessible to westerners. Used in conjunction with material from other Arabic websites and the innumerable Arabic videos on YouTube and DailyMotion, the podcasts enable learners to gain valuable insights into the workings of an ancient and venerable language which few westerners have the courage to tackle. During the past two years I have listened regularly to Arabicpod.net and collected material from numerous other sources. I have now compiled my own Arabic dictionary and greatly improved my listening comprehension. Last week I spoke Arabic for the very first time in my life. A very talented Lebanese student turned up in a French course I teach at a German university. At first we spoke in French, but when he told me he was Lebanese I switched to Modern Standard Arabic. For a moment he stared at me in amazement, then he replied in Arabic. The German students gaped at me in bewilderment when they heard me speaking fluent Arabic, and I must admit that I was just as surprised as they were. Since I had nobody to talk to in Arabic I’d never practised speaking, but the Arabic words just came gushing out of my mouth in a steady stream. It was as if a supernatural entity had slipped into my body and taken control of my mind. I shall continue to listen regularly to the Arabicpod podcasts. I hope that I shall continue to make steady progress, and I would like to avail myself of this opportunity to thank Ehab and Mohamed for their kindness and generosity. We have been featured on Syria’s English language daily newspaper Baladna. This is still in a beta version because the dictionary doesn’t cover all Arabic words at the moment, but words searched for that are not in the dictionary will be recorded so that we can add them soon after, until the dictionary covers all the words out there. Which Arabic dialect do we teach? As this is one of the most common questions we get asked, I have decided to write a brief entry on this blog to clarify the matter. Firstly, I would like to explain that we tend to teach Arabic that can be understood and used throughout the Arab world. To achieve this, we teach the “common colloquial” Arabic, that is shared by all Arabs, as well as classical Arabic. An example of a colloquial word is the word فلوس which is pronounced ‘fuloos’ and means money. This word is colloquial and is used everywhere. The classical word for this is مال which is pronounced ‘maal’. So we try to use such common Arabic words in addition to classical Arabic as we believe this is the most effective way to learn Arabic. We don’t believe one should concentrate on a specific dialect only used in certain parts of the Arab world when one can learn Arabic that is widely understood throughout the Arab world. It is not necessary to learn the Egyptian dialect if your travels take you to Egypt. Our Arabic lessons will enable you to communicate, not only there, but also in other Arab regions. To cater for all needs, we occasionally teach dialects in our lessons but we always mention the dialect that is used. An example of this can be found in the beginner lesson called ‘wake up!’ which uses the Sham dialect. For those of you who are still unsure about which dialect to learn, we advise you to avoid worrying about dialects too much and start learning the Arabic that we teach, which will certainly enable you to become more universally communicative in Arabic. After learning this ‘Universal Arabic’, you will, undoubtedly, find learning the various Arabic dialects much simpler, if you so wish to delve further into the wonderfully, rich world of the Arabic language! ArabicPod has been hard at work (as always) to bring you the best resources to help you on your way to learning Arabic. An Arabic Keyboard for lesson discussions: You can now get writing Arabic letters with ease and share your Arabic comments. Arabic text align: Arabic text has now been programmed to align to the right, as it should be, making the Arabic easier to read on lesson comments. ‘Audio Transcripts’: These are exclusively for Premium Users, you will now be able to listen to each sentence in the pdf and really get to grips with the words. 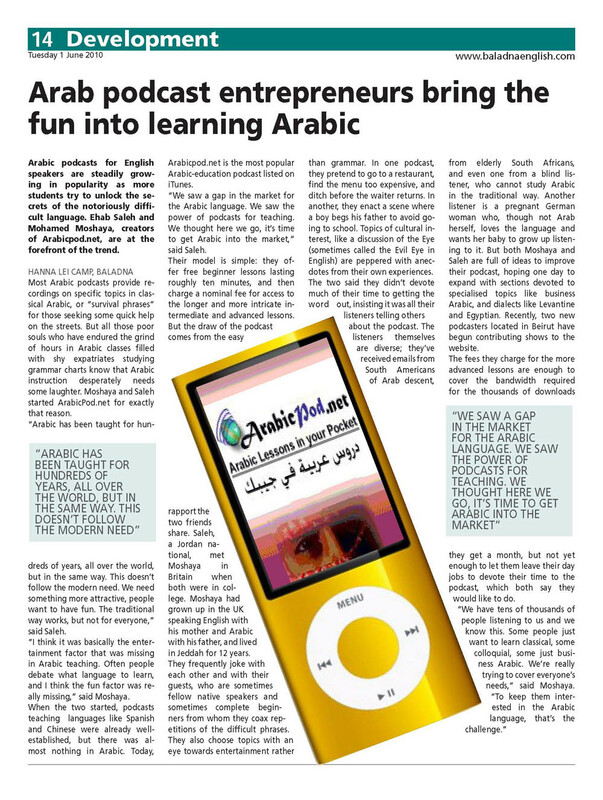 Exclusive games that were created to help you learn certain aspects of the Arabic language. Keep your eyes peeled for more new features coming your way soon! You are currently browsing the archives for the ArabicPod category.